After I shared my thoughts on Herb being sick, a friend reminded me that perfect love casts out fear. 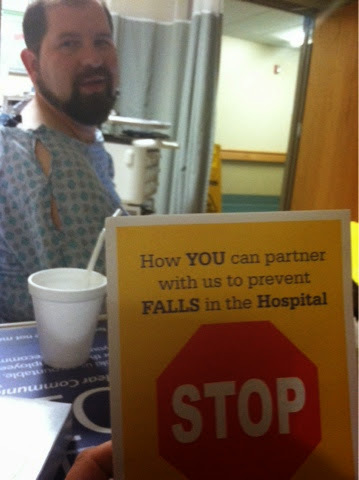 Tonight as Herb and I sit in a hospital room, him still feverish and humorously flagged as a "fall risk," I am praying that my peace not be stolen. Because, as his mother reminded me, Herb is, and always has been, the Lord's. The doctors are trying to find the cause of his extreme fatigue and fevers, and turning over rocks to do so. They are stumped to a degree, which is unnerving, but at the same time I am grateful that his transplanted kidney is not a concern. So I will rejoice and be gentle in spirit because I know The Lord is near. I will not let my heart be anxious about anything. With thanksgiving, prayer, and petition, I will present my requests to The Lord who will guard my heart and mind in Christ Jesus and give me peace that passes understanding. Hugs and prayers for both of you tonight. I love what his mother said.